When I was young, game players were generally happy to read through the rules to a game--often several times--before playing, and were not put off by lengthy rules. Even today, I would much rather read the rules than be taught how to play a game. But nowadays it's nearly impossible to get young people to read long non-fiction (many won't read fiction, even), and people want to try to play a game while learning the rules. Patience, you might say, is no longer a virtue. 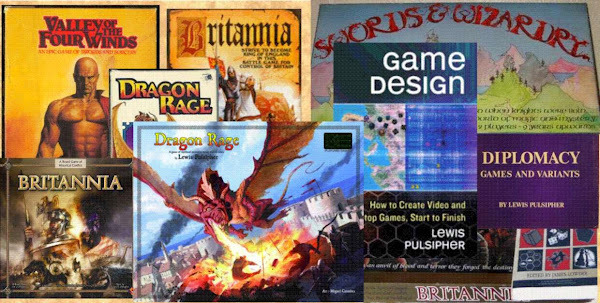 So here I am as a designer, and a teacher mind you, trying to figure out what needs to be done to make game rules as accessible as possible to this new generation. Here's what seems to be needed. First, every rules set should have a "rules often missed/misunderstood" section. All but the simplest rules have more-difficult parts. I'm beginning to think a rules summary (no more than one page) is needed with every game as well. It's notable that (American edition) Settlers of Catan has what amounts to two rules sets, one less formal than the other, even though it is a quite simple game. Clearly, the manufacturers have found that even simple rules can confuse or thwart would-be players. But how about more "modern" methods? If people want to learn a game from someone else, why not try to reproduce that, as much as possible? In other words, why not make a video as though you were teaching people in person how to play? The obvious limitation is that the learners cannot ask for clarification, but the video-maker can try to anticipate questions as much as possible. A video of a play-through (perhaps an entire game, if the game is short enough) would be wonderful for many players who are unsure of their understanding of the rules. Can you include videos with a game? I think a CD should be included in most games that includes video aids. But in my experience manufacturers don't want this added expense, and prefer the online approach. Once again, my experience of "average computer users" is that an auto-starting CD with video is much more likely to be used successfully than online video. What about a podcast? This would be a way to publicize a game and might help those who are very busy, and want to listen to "how to play" while doing something else. Videos and podcasts are not hard to produce if you have good equipment, if you aren't trying to achieve professional perfection. You don't get that when someone teaches you the game, though, so why look for it here? Yes, such things are time-consuming to make. But you have to change with the times. I have heard of examples of videos, and watched the ones Peter Morrison produced for this game Viktory II. I've not heard of podcasts that try to teach the rules of a game. I'm sure Geekdom can specify more examples, which I'd like to hear about. I am presently working on both videos and a podcast for Britannia, and expect to produce similar material for all of my games as they're published. I am constantly (unfavorably) impressed by the number of would-be game designers who talk about producing "artwork" for their prototype and "getting other people to playtest" a game they've never played. This immensely limits what you can do, folks. You don't need "artwork" to play a prototype solo. You're the designer, use your imagination! If you keep a good supply of various kinds of 3D pieces around you can come up with almost any piece you need in no time. You don't need laminated cards for a playtest prototype. If you have some blank business card stock around you can hand-make some cards quickly (or use a computer program to do it). If you need a board, hand-draw one if it takes too long to do a sketch version on the computer. I tend to make wargames, and my initial map used to be hand-drawn with grease pencil on transparent plastic laid across an out-of-copyright map downloaded from the Internet and printed large. Nowadays I have become sufficiently quick with CorelDraw that I usually create a computer map before actually playing, but I start with a hand-drawn map. The first few times a game is played, "errors"--things that need changing--are inevitable. Why inflict this on your preciously-scarce playtester supply, when you can sort them out on your own? While there are some kinds of games that may be difficult to play solo, a good game player should be able to put himself in a state of mind where he can play several separate sides in a "hidden information" game, sufficient to get the worst kinks out of a game before inflicting it in other people. If there's an obvious problem, YOU need to find it and sort it out, not wait for Playtesters to do so. Let the testers play a game that's in a reasonable state, not one where they struggle with things that you should have discovered through solo testing. You'll be wasting their time, and yours! Use playtesters to discover problems you cannot see, not to discover problems you would have found if you'd bothered to play the game yourself. What makes a game "great"? I am writing an article about a game which is supposed to be one of the all-time best hobby games. Naturally, I'll need to explain why I think this. So my question today is, what makes a game "great"? Not good, not a flash-in-the-pan, I mean an all-time great game. I'm sure this must have been discussed before on BGG, and perhaps someone can provide links to known discussions of this type. In the meantime, here's what I've been thinking about (rambling included). To me, a game is great if you can (and want to) play it again and again with great enjoyment over many years, if you can almost endlessly discuss the intricacies of good play, if you can create many variants that are also fine games. Obviously, a game is not "great" to everyone. Chess is a great game, but many gamers can't stand to play it (though a great many have tried). Longevity is important. A new game may be "great", but we simply cannot tell until years have passed. Perhaps not every great game is great by current "design standards", but it may still be a great game in terms of how it affected people and the enjoyment it gave to people. "New" certainly doesn't mean "good" and "old" certainly doesn't mean "bad". In other words, I ignore the "cult of the new" so prevalent in today's gaming tastes. Popularity is not a criterion. There are many popular tunes, movies, games, books, that disappear from our notice in a year or two or three. Great games should continue to be loved year after year after year, just as great novels, movies, music are enjoyed perennially. If a game is one of hundreds that people might want to play, can it be a great game? No, it should stand out from the crowd. If I play a game just to kill time, then the fact that I'm playing it certainly doesn't make it a great game, no matter how many times I play. It's not "oh yeah, we can play that" it's "I'd love to play that"--again, and again, and again. If I can spend my valuable time playing this game or thinking about this game, when I have other valuable things to do, then it may be a great game. If lots of people don't play it hundreds of hours each, over many years, can it be a great game? I thought about including the criterion that solitaire play is rewarding. But for hidden information games, solo is not so practical. Nonetheless, if it's a game that can reasonably be played solitaire, then a great game will be played very often solo, by a great many people. It's difficult to generalize concisely. Perhaps you could say, if a game is played by a great many people, who love to play it, who play it for hundreds of hours (by each person) altogether over the years, who can still enjoy it many years after it was first published, then perhaps it is a great game. Is Monopoly a well-designed game? Given the likelihood of stalemate or very long games, perhaps not. Is it a great game? Here you can argue that it is played by default, because it's traditional, rather than because people truly want to play it. Nonetheless I think a case can be made that it is a great game. A young person might look at this differently than I (55 years). I am interested in your comments. intended to illustrate the game design process. Start at the upper left, go toward the lower right. This is a data flow diagram, NOT a flowchart. Information (or physical items) can flow both ways between processes, or perhaps only one way. Circles represent processes/subprocesses. A rectangle represents an external entity that provides input (such as a playtester). The triangle represents an external entity that receives output. The other symbol is a data store, where information (or objects) is stored. At some point during playtesting of a game, the designer must decide if "there's something in it" (as I put it): if the game is really good enough that people might play it, like it, and would buy the finished version of it. There's really two times when this should happen, once during solo playtests (alpha testing), the second time during playtesting by others (beta testing). The "something in it" point in solo playtesting is an indicator that it's about ready for others to play. The "something in it" point in beta testing usually comes when observing people playing the game and their reactions during and after playing. Usually I need to tweak a game quite a bit from its state at the end of solo play, before I can reach the "something in it" stage of beta testing. Sometimes there doesn't seem to be anything in it during beta testing, and I set it aside for further thought. Sometimes I realize, from solo playing, that there isn't "something in it", at least not yet, so I set it aside at that point. So how do you recognize when there's "something in" a game? That's hard to say, unfortunately. Surveys or written feedback won't necessarily reveal it. In my case, in beta testing when spontaneously (without any urging) people say "I'd buy this game", I know I've got something: I don't remember anyone ever saying that about Britannia, or Dragon Rage, or Valley of the Four Winds, but they have all been quite popular. I am very low-key in beta playtesting, preferring to watch reactions of people rather than try to solicit opinions, in part because people (being polite for the most part) won't say negative things even when asked. I also try not to play, as 1) the designer playing in a game tends to skew results and 2) when I play, I do a worse job of playing, and a worse job of evaluating the playtesting, than if I did either alone. As I'm that strange sort of person who enjoys watching my own games as much as playing, why play? In alpha testing, the "something in it" stage is a gradual realization, coming from observing my own thought processes as I play. My games are, almost without exception, strategy games. When I "see" myself thinking hard about the strategies, and liking the options, then I may think there's something in it. I do not inflict a game on players until I think it is good enough to be OK to play, that is, I've reached that first "something in it" stage. Evidently some other designers playtest with other people very early: not me. My playtesters play games to have fun, not as on obligation, and most are not hard-core gamers, so I do what I can to make sure the game MIGHT be fun before I ask them to play. I am going to try the "Six Hats" method (devised by Edward de Bono) when playtesting; specifically I'll ask players to put on their black hat (the judge) and red hat (intuition and emotion) to see how they assess a game, and then the yellow hat (the positive side of assessing an idea) to see what they like about a game. With local playtesters I sometimes ask them to think of ways to make the game better (the green hat). Every color in Britannia must be played as a whole, not as separate nations, if you want to win consistently. It is worth sacrificing armies or points of one nation to improve the points or position of another by a greater amount. The action of armies at one end of the board can affect those at the other, in the long run. Remember, at a given time position is just as important as the number of armies or number of points. Green is the most defensive of all the colors. It requires patience, not a “conquest” mentality. Offensives that spend lots of armies are a bad idea, even for the Danes, though the Danes will certainly do lots of attacking. Green (and yellow) are limited in the maximum number of points they can score. Consequently, green must work to keep red and blue in check. Generally, the lower the scores, the better off green will be. Put another way, green’s fate frequently depends on others. Diplomacy can be an important tool. If red and blue are at peace, it’s almost always bad for green. The Welsh then have to cope with Irish and Saxons, and the Danes may be faced with a “shield wall” of Angles and Saxons. The Saxons may be green’s biggest enemy. Some people see the game as blue fighting with yellow in the north while green struggles with red in the south. The Welsh must survive and prosper if green is to prosper. Do NOT try to fight the Romans tooth and nail. Submit at five areas to allow for population growth, and strongly consider cooperating with the Roman to occupy his burned fort areas. It is often difficult for the Welsh to maintain a long-term presence in Cornwall and Devon, but that is going to help your score–and especially try to prevent the Irish from settling in those areas. The clear terrain in Wales is often contested by invaders, and Welsh often abandon those areas at times. Try to negotiate with blue to take your trip to York for 12 points. You may be able to fight your way in, but it will be very costly to Welsh survivability later on. Impress on the blue that the Angles, too, will have difficulty prospering if you have a big battle over York. The Caledonians “aren’t worth much” if you like offense, but they can score a lot of points if they survive. They need not be aggressive until facing “starvation”. If you think Picts will attack the Caledonians early in the game, move Orkneys to Caithness. This is why the move order changed from original Brit, to give the Cals this chance. Ultimately, the enemy of the Caledonians is the Norsemen. You may want to sacrifice the Jutes to help another nation. They are one of the lowest scoring nations in the game, though a successful attack on a Roman fort in Kent in Round 5, settling there, is worth 14 points. Some players believe the Danish invasion is the key to green prosperity, while others think the Welsh are more important. The Welsh score more points, but the Danish have much more variability in how much they can score. The Welsh can help Danes secure the kingship by picking off a few Saxons. The Danes may not have much left at the end of the game, but it’s points, not troops, that count in the end. The Danes have to preserve some force during the big invasion, or they may be wiped out too soon. It is easy for the big Danish invasion to “melt away”.